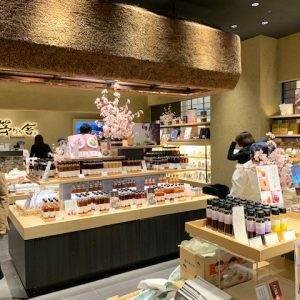 Japan can elevate the simple form of counter dining to lofty levels or turn it into part of the entertainment. 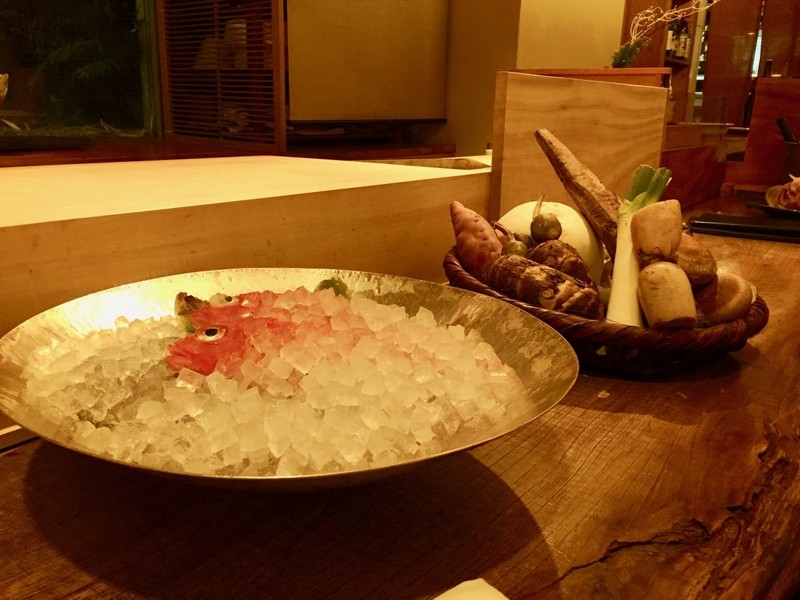 Whether a rowdy izakaya bistro, rarefied sushi bar or a top-end kaiseki restaurant serving traditional haute cuisine, the counter (if available) usually affords a ring-side view of chefs plying their trade. It is a place where diners can interact and chat with the chefs, watching them slice, grill or assemble ingredients into the dishes of the day. 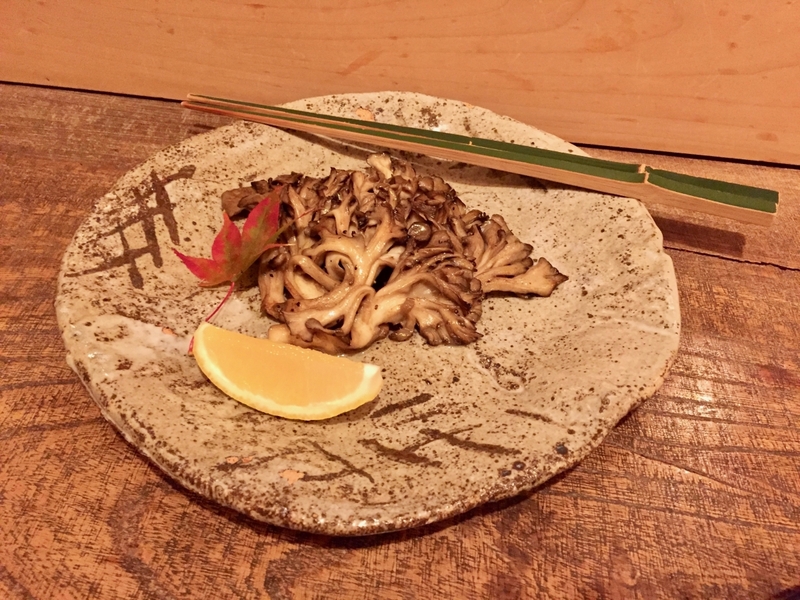 At Tantansai (full name Washoku to Utsuwa no Mise Tantansai), an atmospheric Japanese restaurant near Nogizaka station, at the edge of Roppongi, counter seating is an even more rarefied experience. When we visited on a recent cold winter evening, there were neither chefs nor a kitchen behind the beautifully polished, imposing wooden counter. Instead, the main focus of attention was a striking collection of ceramic vessels and vases set against a picture window framing a small and picturesque Japanese garden. The counter showcases eye-catching pottery from Oribe. The display reminded us of the importance of ceramics, from tableware to decorative pieces, to the overall experience of traditional Japanese dining. 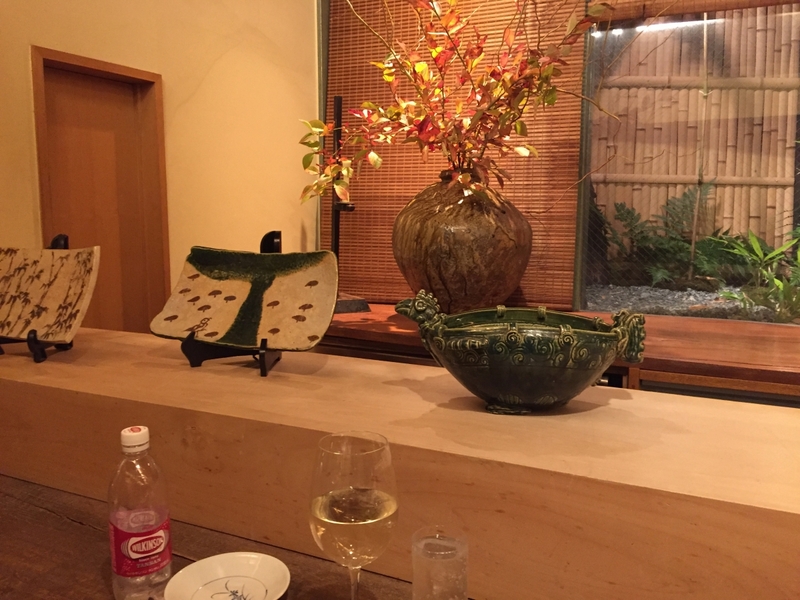 The beauty of the ceramics, mostly from Oribe in Kyushu, contributed significantly to the atmosphere of place and lifted the simple though excellent food. The counter-as-centerpiece was not the only unusual thing about Tantansai. Instead of a detailed menu with fixed prices, we were offered either an omakase course (chef’s choice) from Y8,000 or an à la carte option, outlined in a list of vaguely-worded offerings written in Japanese, such as “a sampling of appetizers on a large dish” or “grilled fish.” Few items listed the prices. After we rather hesitantly asked for the sampling of appetizers and enquired about the fish of the day, one of the staff rolled over a heavy cart carrying a colorful range of cold dishes such as marinated vegetables, salads and simmered seafood on large plates and bowls. It is unusual these days to encounter such a vague pricing system for à la carte fare in a general restaurant. 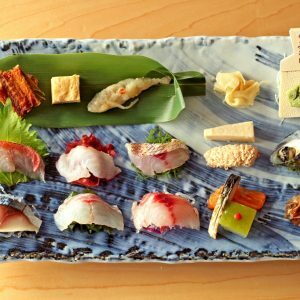 Many sushi restaurants, however, lack menus with fixed prices – leaving diners to simply hope the bill does not make them faint at the end of the meal. So with a mix of curiosity and prudence, we asked the price of the appetizer dishes and were informed they were mostly about Y430 to Y600 for a small serving. Among the dishes we shared was a tiny but good selection of stir-fried mushrooms, a tempura of shiitake mushroom stuffed with minced shrimp, and a marinated green vegetable with strips of aburage, deep-fried tofu. 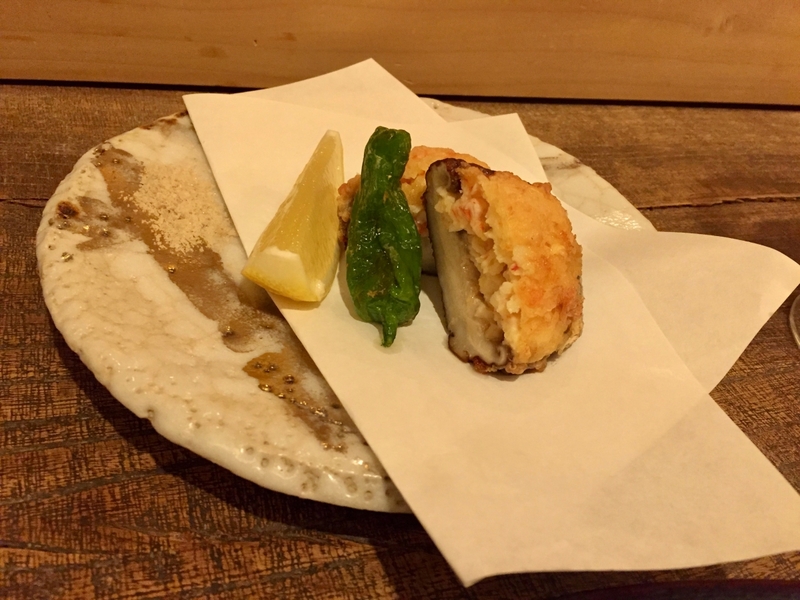 One of the appetizers – tempura of vegetables served with lemon and salt. Tantansai aims to serve expertly prepared everyday food. That set the tone for the rest of the meal. Once we had finished our appetizers our impeccably polite waitress, dressed in kimono, appeared with a cart carrying a tantalizing display of fresh fish of the day, followed by another cart carrying choice cuts of meat. Again, the offerings were presented with no prices, and due to our late arrival, around 9 pm, were limited in range. Our grilled fish – amadai, or tilefish, a particularly tasty type of sea brim – was a little over Y5,000, while the juicy-looking cuts of meat cost much more. Tantansai is not cheap but considering the high standard of ingredients, attentive service and stylish surroundings, is not unreasonably expensive. The fish, which had looked fresh out of the ocean on its bed of ice, was firm and perfectly grilled. The appetizers, all prepared in simple but careful style, were good if unexceptional. The fish are so fresh they look like they are still alive. First-time diners and those with no Japanese language may be more comfortable ordering one of the courses, which start at around Y8,000 for a course that includes a chirashi-zushi (slices of raw fish and other ingredients on sushi rice), and range up to around Y19,000 for a special course that must be reserved in advance but uses ingredients you select on the day. There is a very limited selection of wine and a far wider range of sakes at prices that range from reasonable to high-end. Lunch is a much-more straightforward affair and good value, with a selection of set lunches, which include appetizers, a main dish, rice and miso soup. The lunch sashimi set is Y1,500 and the daily special starts at Y1,080. There is a calm, competent if not slightly aloof air to the service, and a subdued atmosphere that is both rustic and elegant. The selection of ceramics and thoughtful décor offset the simplicity of the food, as does the counter with its garden view and artistic display. For groups of four or more, there are tables along the wall including discreet partitioned areas. 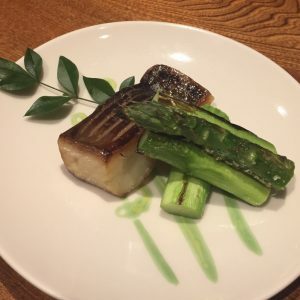 With its sophisticated atmosphere, simple but tasty dishes and convenient location just a few blocks from Roppongi Midtown, Tantansai offers a welcome escape from the frenzy of urban life.